It’s not something they’ve done a lot, but I really like what the 49ers did with their Counter in Week 15 and Week 16 of the 2012 Season. As far as I can tell, they only ran it once in each game, both times in the 1st Quarter. The play is a Counter Right off of the Outside Zone Left action. 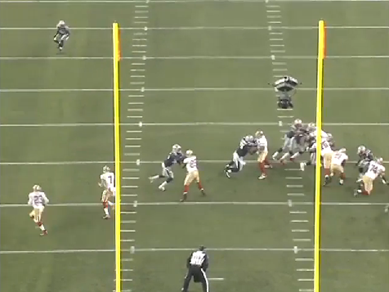 Both times we saw it out of a Splitback Gun backfield, with an H Back to the left. That’s a little strange, because a big chunk of their Outside Zone runs (particularly in Week 15 against New England) were off of the Pistol Diamond formation. Each time they had some minor tweaks, in terms of who was pulling or what happened in the backfield. But the play is essentially the same for everyone else, and probably something they can do out of a ton of formations and with several tweaks to create a lot of looks. 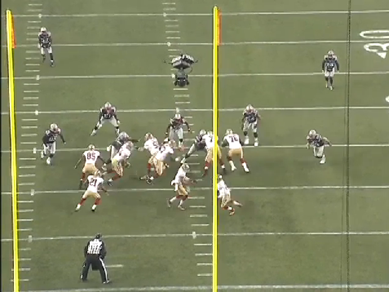 In Week 15, Colin Kaepernick lined up with a split backfield on a 2nd & 6, deep in their own territory. The Tight End #85 is being used as an H Back here on the left side (after motioning over from the right, not shown). 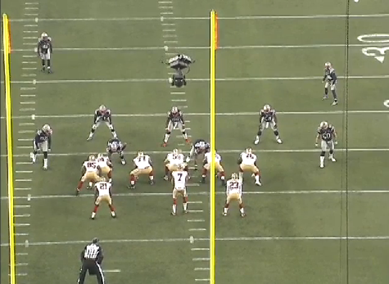 The running back on the right side will come around behind, similar to the way the 49ers run their Outside Zone play. 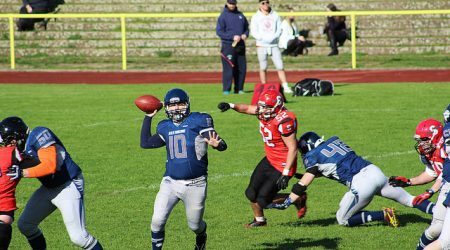 The back on the left takes an underneath handoff and follows his pulling Guard who will kick out. The Tackle pulls to follow the Guard, and he is going to look to roll the hole and lead up on the Linebacker. The H Back takes care of back side pursuit by the Outside Linebacker. 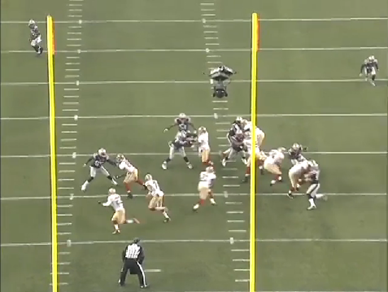 Notice that Kaepernick is using a reverse out, where he’s actually faking to the back running the OZ path, then giving the underneath handoff to Frank Gore. You can see that #74, the pulling Tackle, didn’t get up inside of the Linebacker the way that he should have. If he gets to the inside shoulder, this play can pop for a big gain. Instead, it’s a solid 4 yard gain. In a game that did not turn out nearly as good for the 49ers, they ran the Counter play just once, early in the 1st Quarter with 9:13 remaining. 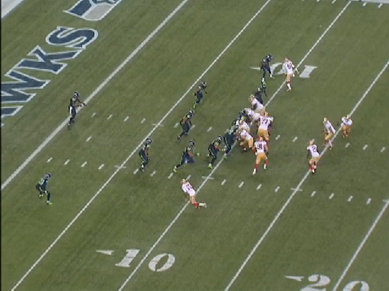 This is a 1st & 10 play, on the other end of the field – deep in the Seahawks territory. Except for the alignment of the receivers being a somewhat wider, the formation is the same one that the 49ers had used the week before. The H Back also did not come in motion, but instead lined up on the right side to begin with. 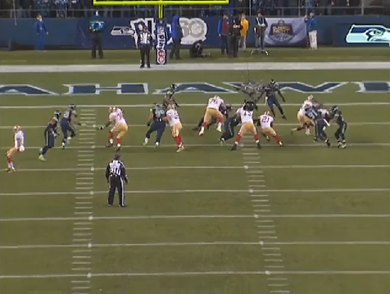 If the Tackle pulls here against the 4-3 Defense of the Seahawks, the H Back has no chance of cutting off the back side Defensive End’s pursuit – especially with the speed of the Seahawks ends. Instead, the Tackle hinges and the H Back is used to roll the hole this time, behind the kick-out block of the Guard. 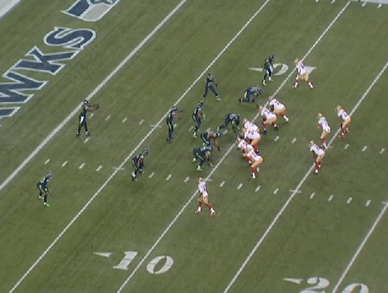 Another difference here is that Kaepernick does not reverse out and fake the handoff to the right back. He’s giving a straight handoff to Gore on the left. 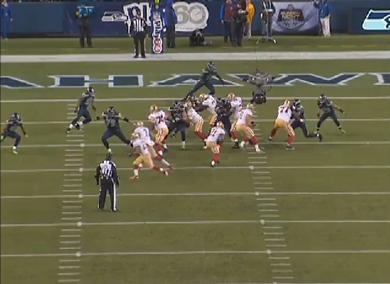 The 49ers get a great angle on the kick-out block, on the inside half of the defender. You would like to see the H back getting a little tighter to the play side Tackle’s down block, but this is a really well blocked play that goes for a 6 yard gain. The Counter is a great play, and with just a couple of tweaks the 49ers are able to use it to create a lot of different looks for the Defense. The Counter is an excellent compliment to the Power, as well as Inside and Outside Zone.